Nutrition is essential to human life, no matter one’s cultural background or period in which one lived. Human Diet and Nutrition in Biocultural Perspective: Past Meets Present, published in 2010 and recently available as an ebook, follows this fundamental building block of life and its impact on society from prehistoric to contemporary times, across the world. 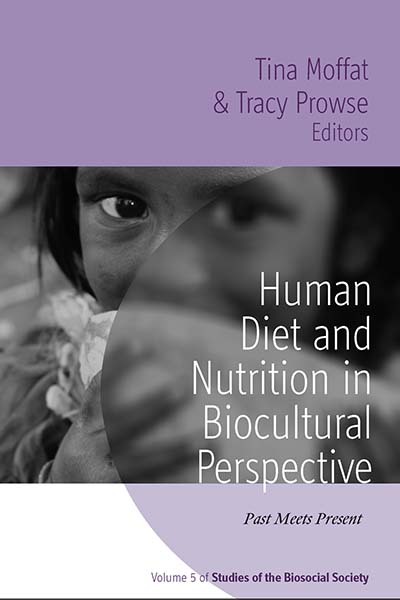 Following, volume editors Tracy Prowse and Tina Moffat discuss the most (and least) enjoyable aspects of editing a collection, changes in the study of human diet, and the way forward in the Anthropology of diet and nutrition. Berghahn Books: What drew you to the study of health and nutrition? Tracy Prowse: I really like food. Seriously, I’ve always been interested in diet and nutrition in past populations. Tina Moffat: I started out in infant mortality studies and child health and realized quickly that nutrition is a major component of child health. BB: How have food and nutrition studies changed since you first were a scholar in the field? What is the most significant development? TP & TM: In the past 10 years food and nutrition has become really hot in Anthropology. In bioarchaeology there used to be one main way to investigate diet in the past and that was through studying the dental health of skeletons. Today, we have developed new biochemical techniques to study diet (e.g. stable isotope analysis of skeleton). Today we view food and nutrition much more through the biocultural lens and have been able to integrate multiple sub-disciplines in Anthropology such as biological, archaeological, medical, and cultural anthropology. BB: Did any perceptions on the subject change from the time you started your research/compiled the contributions to the time you completed the volume? TP & TM: This is a tough question to answer. We don’t think our perceptions changed because we set out to edit this volume with the idea that past and present studies inform one another and we still hold to that. We still think integration of biology, culture, and temporal frameworks is a productive way forward. BB: To what extent has the book contributed to debates among academics within the field? TP & TM: We’re not sure, let us know what you think. BB: What is one particular area of interest or question, that hasn’t necessarily been the focus of much attention, which you feel is especially pertinent to your field today and in the future? TP & TM: Climate change is currently affecting agricultural production, which has a direct impact on human health. We think there should be more studies in Anthropology of climate change in past, present, and future and its impact on human health and nutrition. BB: What did you like most about writing this book? TM: I loved working with my co-editor Tracy! TP: I really enjoyed reading the papers the authors submitted, some of which were completely new to me. BB: What did you like least about writing the book? TP & TM: Compiling the index was torturous…but it was worth it. BB: What do you hope that readers get out of this book? TP & TM: We hope that readers buy the book because there’s something in it that they’re specifically interested in, but they also read something completely new that generates new ideas about their own research and interests. Tina Moffat is Associate Professor in the Department of Anthropology at McMaster University. Her research focuses on child health and nutrition in relation to environmental health and urban ecosystems. She has authored and co-authored numerous scholarly journal publications on child growth and infant feeding in Nepal and nutritional well-being and obesity among North American school-children. Tracy Prowse is Assistant Professor in the Department of Anthropology at McMaster University. Her research explores diet and health in past populations using paleopathological and isotopic analyses of human bones and teeth. She has published on the paleodiet of Roman Italy in the American Journal of Physical Anthropology and the Journal of Archaeological Science.